Outlook and outlook express password recovery program recovers saved password including for Microsoft Office Outlook and Outlook Express Mail accounts. Password recovery program easily recovers passwords of various Email services like Gmail, Yahoo, Rediffmail, Hotmail etc. Password recovery program supports all versions of MS office outlook and office outlook express. 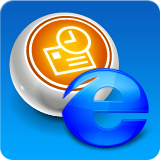 Internet Explorer Password Recovery Software recovers all lost or forgotten internet explorer saved Passwords including for E-mail, Newsgroup accounts, Search engine searches, Magazine subscription, Web forms and other password protected applications generated on your internet explorer.